To help clients gain control of their disease and achieve meaningful change, educators must identify which teaching techniques work—addressing patients’ fears and meeting them where they are, for starters—and which don’t. Data from the 2007 National Diabetes Fact Sheet (the most recent year for which data are available) put the total number of U.S. children and adults with diabetes at 23.6 million, which translates to almost 8% of the population. And each year, another 1.6 million adults receive the diagnosis from their physician. Especially for adults with type 2 diabetes, which is strongly associated with unhealthful lifestyle behaviors, this diagnosis sometimes comes with guilt and often stirs up fears and concerns. Either with regrets about past lifestyle behaviors or traumatic memories of a family member’s diabetic complications, newly diagnosed type 2 diabetes patients always come with baggage—but it’s the baggage of their life. 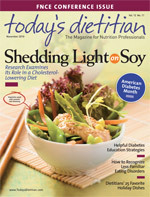 While each patient brings unique character traits and life circumstances to the counseling table, there are several strategies that experts believe work best for certified diabetes educators (CDEs) and dietitians who treat patients newly introduced to the world of type 2 diabetes. When a patient presents with an acute illness or condition, healthcare professionals are adept at observing symptoms, diagnosing issues, and prescribing treatments to cure such health concerns. But type 2 diabetes calls for a different paradigm, and it requires both the patient and the healthcare professional to take on partner roles in long-term disease management. Rule No. 1, according to Martha M. Funnell, MS, RN, CDE, research investigator in the department of medical education and the Michigan Diabetes Research and Training Center at the University of Michigan: Both healthcare professionals and patients need to understand and accept their respective place in the diabetes care equation. She says CDEs should help patients understand the significance of their role in their diabetes management while also recognizing their own role (which is not to get people to change) so that both can work in tandem to effect the best change possible for each individual patient. The philosophy of patient empowerment, which involves engaging and involving patients in their diabetes care vs. giving them purely factual information about their disease in a strict, regimented lecture format, has received much attention recently and has proven successful in diabetes management. She says a solid partnership can serve as a great foundation for positive behavior change and overall better diabetes management. The benefits of patient empowerment can be seen particularly in the education process. The empowerment model leaves behind the lecture format of diabetes education and instead leans on patients themselves: their experiences, questions, and solutions. For a person starting on insulin, a purely lecture-based education session could explain the basics of how to clean the skin, pinch up the skin, etc. But for patients who’ve likely learned this from an office visit or an earlier session, “they need to talk about why sometimes it hurts or the times when they wondered if they took enough insulin,” says Nwankwo of what someone would gain from a more patient-centered educational session. “They have specific questions that don’t get covered in a generalized education program designed on what people feel people with diabetes need to know. “With the patient empowerment model, there’s also the understanding that education is ongoing and lifelong. It does acknowledge and appreciate that diabetes changes and learning needs change and that people form a team that will hopefully be a lifelong experience,” she adds. Newly diagnosed patients often exhibit feelings of guilt for “causing” a disease that can be delayed or prevented in some cases or fear from memories of loved ones who faced diabetic complications. Nwankwo sees this as one of the main challenges in counseling newly diagnosed patients. “Patients frequently say that it’s their fault they got diabetes. [They feel] they didn’t exercise enough, [didn’t] listen to their doctors, ate the wrong foods, etc. They see themselves as the source of the problem and they don’t know how to get out of it,” she says. These feelings and concerns are also known as diabetes-related distress, which a majority of newly diagnosed diabetes patients experience and which can be detrimental if not addressed. “We know from [a previous] study that about 85% of patients experience severe distress at the time of diagnosis and that 15 years later, about 43% of patients are still experiencing [many] of those same feelings. Those feelings are the primary determinant of [patients’] self-management behavior,” explains Funnell. In addressing such emotional concerns, Funnell says it helps to know who you’re trying to reach. In adults, type 2 diabetes accounts for the vast majority (90% to 95%) of all diagnosed cases, according to the National Institutes of Health. Because of this, Funnell advises taking note of how adults learn. • How did you feel when you were diagnosed? • What experiences have you had with diabetes before your own diagnosis? • What information do you want to know? Because each patient is at a different place in his or her life at the time of diagnosis, there is no one road on which to start patients when they first come to see an educator. But CDEs say listening skills can be key to helping each individual find a path for successful diabetes management. To best help those newly diagnosed, you must start wherever they say they are, not where a curriculum sheet designates. To illustrate this principle, Nwankwo does a 24-hour food recall with patients to form a basis for their typical food choices, their routines, the frequency of their meals, etc. She then discusses with patients different improvements they might make to better manage their diabetes. “Give them several options and then they can choose one thing that they can do to make a difference (regarding their food, timing of their medicine, or building in exercise). But it’s still just starting where the patient is and being specific to their life,” she says. In the process, she also uses food models, which she finds help patients better visualize the concept of portions. “If you can take exactly what they’re eating at that moment and build from there, it helps them assimilate it much quicker, and they’re often making much better choices with their food the next time you see them,” she says. Marlisa Brown, MS, RD, CDE, CDN, a certified diabetes educator and chef, stresses that each individual requires a plan to meet his or her unique needs and life circumstances. “Even if I have an idea of what should be done, take into consideration what the patient can do. Make concessions to meet the reality of the situation,” she says. Once patients verbalize their struggles, educators can start recommending that they experiment with solutions and formulate goals. Goals for diabetes patients are paramount to success, but note that not all goals are equally beneficial. Funnell explains: “For example, if a patient is interested in losing weight, to set a goal of losing weight is not very helpful. [I tell patients to] pick one or two things that [they’re] going to do in the next four or five days and start there,” which allows patients to gain some self-efficacy and sense of accomplishment. She also encourages educators and patients to think of this solution-finding as experiments. “A reason to think of it as an experiment is because you often learn as much from what doesn’t work as from what does work,” she says. Try different things and see what works. When one possible idea or goal doesn’t work, suggest patients try something else vs. thinking of themselves as a failure. “It’s a constant process of trying new things and seeing what works,” says Funnell. For patients who enter a session feeling defeated and downtrodden for failing to reach a goal, making note of at least one thing they’re doing right can also be helpful. Any positive reinforcement can help build confidence and a feeling of accomplishment, which can lead to more accomplishments and a better-managed disease. Nwankwo advises making sure clients’ goals are of an iSMART nature: inspiring, specific, measurable, achievable, relevant, and time specific. “It’s something that’s finite enough for them to accomplish within a day or two, and they can continue [with the goal] until the next time I see them,” she says. Instead of the vague “I want to lose weight” goal, an example of a more specific short-term iSmart goal would be increasing vegetable intake by eating broccoli on Thursday, carrots on Wednesday, and cabbage on Monday (all details that would be decided upon by each patient). In addition, Brown finds that having a hard copy of goal specifics can aid in patients’ efforts at behavior change. “I put the goals that we come up with on a goal sheet with them when they’re [at my office] and I print it for them,” she says. Many healthcare providers who deal with patients with type 2 diabetes, a disease in which lifestyle behavior is a big determinant of disease course, note patient resistance to change as a big obstacle. However, Funnell advises educators to see through patients’ eyes to another perspective to better help them succeed. “The whole concept of resistance to making change is clearly a challenge that healthcare providers identify,” notes Funnell. “Yet if you ask a group of patients [whether they believe they’re resistant to change], they would give you a very different answer. They would probably identify struggling with making changes but not that they’re resistant—just that it’s darn hard [to make changes]. If it wasn’t, we wouldn’t live in a country where obesity is a major public health burden. “I think education and helping people learn how to make changes in behavior go hand in hand. You just don’t change everything all at once,” she adds. A number of studies on the topic have shown that the previous standard of teaching patients clinical information in a general lecture format does not help them change their behavior. “We’ve evolved [in how we educate these patients]. We used to focus on giving people a lecture on content; then we learned that we needed to teach them some behavioral strategies. These aren’t things we apply to them; these are things we teach them so they can use them in their own lives,” Funnell says. Funnell asks educators and other providers to not hold this fallacy of “resistance” against patients, as all patients with diabetes want to live a happy and healthy life, no matter what choices they’ve made by the end of each day. When counseling patients newly diagnosed with diabetes, the way in which educators speak to a patient can make for an open ear or a brick wall. “If you just tell patients what to do, you’re going to get a wall,” says Brown. To avoid this situation, Funnell instead discusses possible options for treating diabetes. “I always start by asking patients what they want to do and what they believe will work for them. I also talk to patients about what we know (not what you should do). If patients are having a hard time finding a solution, I’ll say, ‘Here are some things we’ve learned about what helps people lose weight. Let me tell you what some of those are, and tell me what you think of them and if you think any of those would work for you. Problem solving with patients is another way for educators to distinguish themselves from the scolding teacher type, says Brown, who seeks to be seen as more of a partner to whom patients are more willing to listen. “Come up with problem-solving strategies to make it possible for them to make small changes without completely interfering with their lifestyle,” she says, noting that she’s found success with this approach. While there’s no magic number for how many hours of education individuals with diabetes will need to best manage the disease, experts say patients should be advised at diagnosis on the long-term nature of diabetes, noting that ongoing education should be stressed to best manage a disease that can change over time. “One thing we’ve learned very clearly is that a one-time education program is not adequate and that people need ongoing help, particularly in making and sustaining literally a hundred behaviors a day that they need to maintain for a lifetime,” says Funnell. So to think that a patient could see a dietitian or an educator a few times and be sufficiently prepared for the twists and turns of this disease is shortsighted. In terms of overall diabetes management, the data show that group education is just as effective as individual education, but Funnell says one exception could be meal planning with an RD. “I think there’s a real benefit to doing that on a one-to-one basis as opposed to talking about what I like to eat in front of 20 people,” she says. Sometimes knowing what doesn’t work can be as helpful—if not more so—than knowing what does. And when it comes to managing type 2 diabetes, Funnell knows two things that haven’t worked in the past. “I think we can say … that telling people they should lose weight and exercise doesn’t work. We’ve tried that for many, many years, and that’s why we believe patients are resistant to change,” she says. She also notes that giving people lots of “shoulds” and new ways to do things instead of helping people think through how they can fit a change into their life also isn’t helpful in the long run. “We’ve learned that giving people a lecture on content doesn’t accomplish much and that just focusing on behavior change doesn’t accomplish much. You really have to focus on the knowledge piece, the behavior piece, and the emotional side of it all as one thing because that’s how patients think about it,” she says. No matter the barriers to such a patient-centered way of treating patients with type 2 diabetes (though Funnell doesn’t see any), she believes it’s the best way forward—if healthcare professionals can put in the effort alongside patients.